While on a run one day, Maise gets into a terrible accident. A hot-burning electrical fire consumes her, destroying her face. Where her nose, cheeks, and chin used to be, now there is . . . nothing. She is lucky enough to qualify for a face transplant. But with someone else's features staring back at her in the mirror, Maise looks -- and feels -- like a stranger. The doctors promised that the transplant was her chance to live a normal life again, but nothing feels normal anymore. Before, she knew who she was -- a regular girl who ran track and got good grades, who loved her boyfriend and her best friend. Now, she can't even recognize herself. From New York Times bestselling author Alyssa Sheinmel, coauthor of The Haunting of Sunshine Girl, comes a gripping and gorgeously written tale of identity and love. This is a story of losing yourself, and the long, hard fight to find your way back. 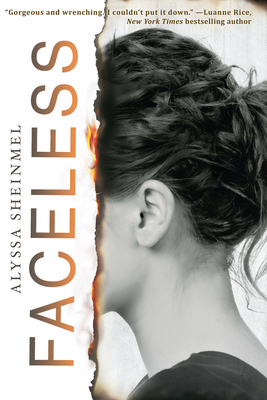 Alyssa Sheinmel is the New York Times bestselling author of several novels for young adults including Faceless and Second Star. She is the co-author of The Haunting of Sunshine Girl and its sequel, The Awakening of Sunshine Girl. Alyssa grew up in Northern California and New York and currently lives in New York City. Follow her on Instagram and Twitter at @AlyssaSheinmel, or visit her online at www.alyssasheinmel.com.